I will show a different image for this week of the 4 which were done (The Collector was done for the 2002 Chess Festival and was a monster success in t-shirt sales). What I just found, while still unpacking stuff from my return from Georgia in 2008 were some posters by the artist, Bill Hannan, of these images. Each are signed and numbered, and affordable and perfect for framing in your office, den, or kitchen (that last one is a joke of course). They aren't numbered to 50,000 like in a Bev Dolittle print (isn't that kind of over the top? ), but somewhere from 1 to 50 although I think the lower numbers are already gone. The size of the actual art is about 13 x 12 (or so) and the CHESS? one is mounted on foam core board (which can be easily removed if you are going to frame it). 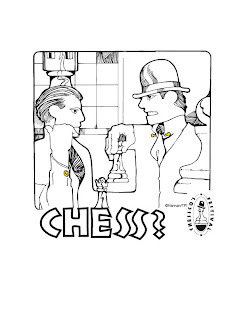 One of the reasons I commissioned Bill to do this was because of the plethora of bad chess t-shirt designs. I don't mean a few here and there I mean, serious amateur stuff in huge quantities. When I was a college kid I remember being in Lary Jonson's art shop (lots of really cool stuff) and I recognized some art by some 25 year old named William Hannan. I said to Mr. Jonson (later he became Lary), "I've seen those posters at the college and around town." Lary replied, "People are now collecting Bill's art, already." You could recognize the big eyes, hands, and soulful expressions whether it was Shakespeare or a Martian. His ideas were always a treasure trove. His basement was full of almost forgotten art. He did signs, books, brochures, hand mades and etc., etc. He was in Germany while in the army and learned more. He had been a dismissed student of the famous art teacher and calligrapher Fr. Edward Catich. Catich kicked him out of art school for being a screw off! Bill told me, "That was the best thing that could have happened to me. I got serious after that!" Later Catich complimented him for righting his ship! 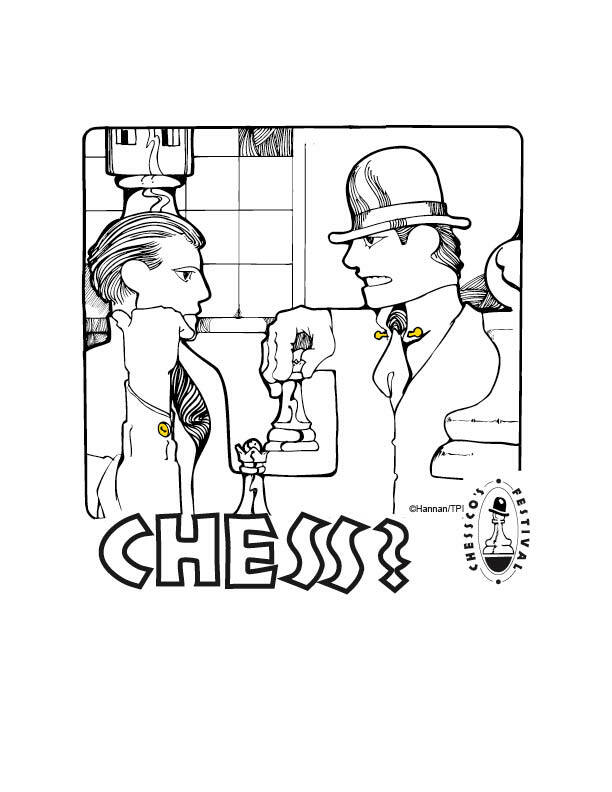 There is also a full page of this art in the current issue of Chess EXTRAS #5... and some additional data. (Subscription $65 for 6 issues). A mounted poster of CHESS? is available for $24.95 + $6.50 for S&H for mailing inside the USA. My supply of other artwork in what follows, in mounted form, is not yet discovered and I suspect that was because I only had a couple made to see how the first one did. Everything Bill does has a "texture" to it. Lines, thick and thin. And always unusual things IN the art such as on these 3 I asked for ONE extra color to be included as a micro hi-light.